The Hampton’s Diet is a low carb diet written by the former medical director of the Atkins Center – Dr Fred Pescatore. Many are seeing the diet as a progression from the (often derided) Atkins Diet. 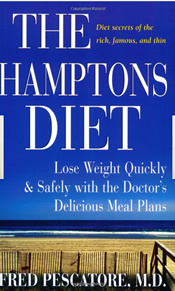 There is also a striking similarity between Hampton’s Diet and the South Beach Diet. It can seem jading to receive yet another diet book, adding to the confusion, but there does seem to be a healthier picture emerging with the Hampton’s Diet. The Hampton’s Diet places a lot of emphasis on consuming the right kind of fats – specifically mono-unsaturated fats. Dr Pescatore has picked out Macadamia Nut oil (and it must be Australian as well!!) as being the best cooking oil to use (rather than olive oil). He devotes an entire chapter to oils and fats. Macadamia Nut oil is expensive – but hey – so is most decent food. However, to pick out a single food as being the “magic” ingredient seems foolish. The Hampton’s Diet is all about quality carbs – the less processed the better. Where possible the food should be organic. There is a controlled weight loss phase, but other than this – there don’t seem to be any severe restrictions (even moderate amounts of alcohol is allowed). The diet bears resemblance to a Mediterranean diet (which the author goes into), and makes significant changes to the USDA Food Pyramid. A “Good” Low Carb Diet? If you’re trying a low carb diet, then the Hampton’s Diet seems to have the most sensible advice – particularly compared with Atkins. Whole foods, no processed foods, healthy fats… Atkins (and South Beach Diet) have resulted in a whole industry of processed low carb snack foods. At last we are waking up to the fact that good health must go hand-in-hand with weight loss. But to be honest, the book seems to be very opportunistic. It arrives right on the coat-tails of the South Beach Diet’s success, and right at a time when the success of (the now deceased) Robert Atkins is declining. Is there a connection between the author and the sales of Macadamia Nut oil? Sub-titles like “Diet secrets of the rich, famous, and thin” are absolute nonsense, and nothing more than a marketing gimmick. Look for high protein and low carb recipes here.